Mindcraft is something I knew very little about up until a few weeks ago. My own kids were playing it on their ipods. I would hear kids in the halls talking about it and see them playing it around the schools. But I really had very little understanding or experience with it until recently. Well, today I am so blown away by this game and its elementary graphics, complex problems and creative opportunities that I want to share a bit of a story that is still being written. At last year's Educon 2.4, a fella named Chad Sansing shared with me how he was using Minecraft with his students. It was a negotiation tool as well as a space where kids could engage with dilemmas and creatively find solutions in a gaming environment that they enjoyed. I tucked the info away and didn't do much with it since my district didn't have a license or server or anyone really talking about it or expressing an interest in it. Fast forward to this past November (roughly). I had a tech teacher come to with issues regarding 2 of her classes. One of them was a class of 16 8th graders-all boys-and she has them for the last period of the day. Oh and did I mention, they all didn't choose to be in computer apps (that's another post). Needless to say, it made for a really tough experience for the teacher AND the boys. She was actively seeking ways to engage them but all of her efforts came up against their walls and it seemed like a constant struggle for both her and her students. The kids were struggling to stay engaged, management was an issue and she knew it. She was challenged like never before and frustrated to the point of tears BUT because she is an awesome teacher who cares about her kids more than her craft, she wouldn't give up and was willing to explore creative solutions for this problem. That's when the idea for using Minecraft came into the picture. We discussed it, looked at how some other classrooms around the country were using it, decided to give it a try and came up with a plan. I told her that if she would write the PO and get a license, I would get it going in her lab. I knew nothing about installing stuff on a server and she knew nothing about Minecraft. Sounds like the perfect storm, right? Well, we had our work cut out for sure. She ordered and I installed it. It worked. Mostly. I had to figure out a few issues but overall, just know that if I can get a MinecraftEDU server going, anyone can. Really. I know there are things that could be tweaked and controls we could be utilizing that we have yet discovered, but for practical purposes, we are up and the kids are building. Seriously, if you are considering it and want to run it off your own server, they have created software that makes it really easy to do. Look into it here. Also, I discovered Joel Levin aka The Minecraft Teacher (@mindcraftteachr on the Twitter) who has been proven to be a very knowledgeable and responsive resource for us during this project. Follow him if you are looking to connect with someone who knows this stuff really well. Apathetic students have become actively, authentically engaged AND enjoy it. Students who kept to themselves socially are now interacting with their peers to solve problems and share what they know about the game as they work cooperatively on challenges. Students who were disruptive and creating management issues are seemingly using their powers for good in the game and meeting behavior expectations in the class. Rich conversations are happening around "citizenship" in the digital world of Minecraft. Some students have destroyed others' creations or set into motion within the game things that have created problems for others in their community which has sparked meaningful, student-driven dialogue on what is appropriate behavior in the Minecraft space. I believe it is also forcing them to reflect on their behavior in the actual classroom space as well. Newbies are now gaining command of the Minecrafter's language and controls, growing their confidence to explore and build within the game. Experts are taking leadership roles and helping their peers, developing patience and teaching others what they know about the game. The teacher is modeling what it means to be a learner alongside her students because she also is newbie. Students are beginning to police themselves and develop ways to solve problems through communication and collaboration. Students journal on their individual experiences within the game, sharing their ideas as well as their frustrations. We have figured out how to bring in maps that others have created to challenge the students with specific dilemmas they must work out. There's a lot of sunshine here but please don't think it's been all unicorns and rainbows. One class got out-of-hand because of students being disruptive and destructive in game and the teacher had to shut down the server. However, this frustrating event led to a great conversation with students taking ownership of their actions and discussing solutions to keep such things from happening again. So the students themselves called out the opportunity as a teachable moment. They were motivated to solve the issues so they get back into the game and continue their work. I rarely see students respond in such a way when it comes to issues in other content areas. The teacher has also felt uncomfortable by allowing the students to "play a game" for the majority of her class. But as the students become more involved and she is learning more about how the game works and what rich opportunities for learning it creates, she is settling in to the understanding that gaming can be an invaluable piece to the learning puzzle. Also, we are still working to figure out all the workings of the server-side of the game, how to best manage the data, modify things and get the most out of this transformative gaming environment. The next steps are going to involve exploring maps and searching the forums to find out how other teachers are using Minecraft with their students. She is also looking at having her students build websites sharing their knowledge on the game as well as giving them blogs where they will be able to share their personal experiences involving Minecraft and their learning. 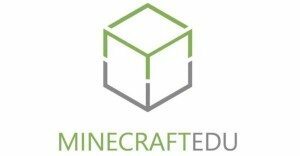 If you have anything to offer regarding Minecraft in the classroom be it links to resources, your own blog posts, pitfalls, examples of student creations, whatever, PLEASE share in the comments. So one of the most practical ideas I got at Educon came from Sean Nash's session where he used a "Silent Chalk Talk" to get those of us in the session engaged, thinking and sharing about the idea of shifts in education. This Chalk Talk protocol, practice, activity...whatever you want to call it, was new to me and I really like it. He gave us a general topic and we silently "talked out" our ideas with the chalk. It was brilliant. And by the end of the allotted time we had to write on the board (giant poster made w/butcher paper hanging over lockers outside the classroom), it was completely filled with ideas, arrows, lines, etc. Next, we went back to the classroom and debriefed the experience. The overall sentiment was that of excitement. I think most of those that participated in the activity, including myself, found it really worthwhile and meaningful. I knew right away that the Chalk Talk activity was something I wanted to share with the teachers I work with and this week, I got my chance. 8th grade students adding their ideas to the board during their first chalk talk experience. I went into a teacher's class to help her plan for her unit of study on the Middle Ages. I figured beginning a new unit would be a perfect time to introduce the "chalk talk" so I pitched the idea to her, shared my experience with it and she agreed. Her students just finished learning about the fall of Rome and now they are moving into the study of the Middle Ages so we decided to pose 2 questions for the students to engage with during this activity as an intro into the unit. The first question activated prior knowledge and asked for explanations for the fall of Rome. She posted that and allowed them 10 mins or so to put their thoughts on the board and to make connections. They silently filled the board and then discussed their ideas briefly before beginning the next silent chalk talk phase. The next question was much more open-ended and simply said "So Now What?" The goal with this was to see if the students could predict what happened in Europe after the collapse of Rome. This phase was met with much more excitement as I noticed the students rushed to the board more quickly than they did with the first question. My thought is that because they were free to think about this open-ended question for themselves and because they knew they didn't know the "right answer" to the question, they were safe to share their "maybe this happened" ideas. Every student shared at least one idea and most shared a few. Collectively, they totally nailed it and I think this will give them a great foundation on which to start their conversation tomorrow on the beginnings of the feudal system. I even heard a few say they really enjoyed this activity. The only downside was not having enough time to fully debrief all their ideas, but they will dig deeper tomorrow. 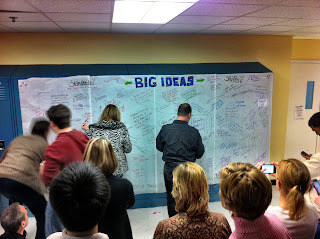 In this case, Chalk Talk provided an experience in which all the students participated. Besides helping them articulate their thinking, I believe it allowed them to experience the power of collaboration and witness the value that comes with sharing ideas in a safe space. I can say that the Chalk Talk is a great activity for all grade levels...really for all learners. Now that I have a great example to share from within our school, we can promote the Chalk Talk with more teachers and hopefully I can model it for them by using it in a professional development session soon. Have you used "Chalk Talk" with your students/faculty? If so, share your experience in the comments! Since bullying is a common issue in schools, especially middle schools, I decided to copy the creative action of Jeff Nichols, another coach within our district, by adding "The Bully Button" to our school's main webpage. When a student clicks this button, it takes them to a Google Form I created that allows them to quickly report a bullying incident with as few or as many details as they would like to share. They can choose to identify themselves or they can remain anonymous. Once they submit the form, I have it set to notify via email the school administrator who can then address the incident. If you are a Google Docs user and want to set up something similar for your school, here are the steps you can follow to make your own "Bully Button." Create a button using whatever tool you are familiar with and put it onto your website (I use PowerPoint and then simply snip out the image and save as a jpeg). You may also simply put text on your site and link it to the form. A "button" is not necessary but stands out more than simple hypertext. Create the form in Google Docs and copy the link to the live form to your clipboard so you can link the button/text on your school webpage to your live form. The link to the live form is always at the bottom of the page when you are editing the form. Next, share the form with whoever will need access to the reports* (admins, counselors, SRO, etc.) by clicking "SHARE" in the upper right hand part of the screen and entering their email addresses. The default is for them to be able to edit. Leave it this way. *These users must have a Google account linked to the email address you enter in order to view the responses to the form. Now, click on the TOOLS menu and choose "Notification Rules." Check the boxes "A user submits a form," "Any changes are made" and "Email Right Away." This will ensure that when a form is submitted, you will be notified via email w/a link to the form and can quickly view the info. You will also need to make sure all the people sharing the form follow these same steps to set up the Notification Rules so they get the email. Share with your faculty, staff, parents, and students that the option is now available to them and hopefully they will use it when needed. Now that we have this button live, I used our school's social media presence to make students aware that they can now report bullies digitally. I hope this creates a way for students who are reluctant to speak out about bullying incidents to share what they know with someone who will step in and help. I am sure as with any opportunity to anonymously share information, we will get some bogus reports BUT if we get one genuine report that allows us to help a victim, then it's worth the time it to took to do it. I know for me, I would have never called a "hotline" or filled out an incident report and put it in a box, but I probably would have clicked a "bully button." 3. Forced me to look at my own personal strengths and weaknesses. 4. Inspired a personal/sincere passion to make kids into confident risk-takers who knows how to learn and will find success. 1. I will sleep when I die. That is it. 2. I need to be more reflective. Period. Okay, so maybe not Period. I need to be more reflective, make those reflections concrete AND transparert through this blog while constantly reevaluating my role as teacher/learner. 3. PLN's are great virtually but PLNs are AMAZING when face2face connections are made! For me, those face2face connections act as an affirmation to this frequently indescribable notion that I have surrounded myself with brilliant learners who share similar passions and dreams for a successful, SUSTAINABLE educational system that addresses the needs of EVERY LEARNER every day in every classroom. 3.2 Avatars are often misleading. Just because you expect someone to sound a certain way or be a certain height, don't count on it. 4. Presentations are great but conversations are way better. I could listen to Joyce Valenza talk about citation issues or Kristen Hokanson share on how her role as a parent shapes her view of education. Would I learn something? Maybe. But would I learn more by talking to to others who are wresting with the challenges and ideas they shared? Absolutely! The conversations I have engaged in with my fellow Educonners and PLN have been meaningful and transformative on many different levels. 5. If I don't reflect AND ACT with some sense of immediacy on the feelings, ideas and challenges that have been imparted to me through this learning experience then I am failing myself, my colleagues and those kids who have a right to become more passionate, equipped learners. 6. People here are approachable, social and want to connect just like I do. Waiting to be introduced doesn't get you anywhere. Go for it! Introduce yourself and prepare to be overwhelmed by the kindness, sincerity and willingness to share from like-minded folks. 7. Make sure you understand the precise location of your hotel in relation to those places you visit and don't allow yourself to get too far from where you will rest your bones at the end of the day even if you think it's not all that far. Reflections and thoughts on some of the sessions I attended and conversations I had will soon follow. A follow up to the previous post- Everyone here is amazing and all my fears and anxiety were a waste of time. Thanks @djakes (David Jakes) for your comment and leveling the playing field. All my expectations as to how awesome this conference, as well as the people, would be have been blown away. This experience as a whole has engaged me in such a way that resistance is futile and growth is inevitable. Educon is way more bigger than the sum of its parts. This will be my first time to attend Educon and as I sit here in the Orlando airport with some time to really ponder what's about to go down, I am excited and nervous all at the same time. It's like...well, going to my first Educon! I'm excited about all that I am going to learn as well as the potential for some transformative, engaging conversations that I hope to involve myself in. But then again, I am nervous about those conversations as well. You see, for me, lots of the folks attending Educon are those that I have put up on a pedestal and in my geeky world of education stuff, lots of these folks are almost like celebrities to me. No, they don't make money like Brad Pitt and aren't household names (at least not to 99.9% of the other people I know), but they are the people leading the conversations within education that matter to me. I see them as brave people blazing new trails daily with a sense of purpose and confidence that is very admirable. They talk about the things I am passionate about and challenge those notions that I sometimes don't fully understand or want to change within myself. They are the people that help me grow as a professional educator, the people I look to when I need to find direction and keep moving forward. So to be sharing the same room with them or even the same building is a bit intimidating and to think that I could actually find myself tossing around ideas and challenges with them, well that's just plain nerve-racking. I know it's just me and I know (or at least hope) that they don't see themselves that way. And from what others who have been to educon say about the awesome conversations, I am sure all are very approachable. But I still have that hurdle to get over, that self-induced feeling of intimidation. I guess we will see how it goes. I am sure it will be an awesome experience and regardless of my feelings, I am ready to jump in with both feet... shaky as they may be! And if my one encounter with a REAL celebrity (Lance Armstrong...I am a competitive cyclist, so he's a pretty big deal to me) proves to be true, I will quickly realize that we are all pretty much the same. As Frederick Buechner said in a round-about way, we are people seeking to find and make a difference in that place where our passion meets the world's great needs. Over the course of the last few months, we have begun our initiative to create better digital citizens in our schools and community. This has led me to giving lots of talks to students as well as parents and one of the illustrations I find myself using over and over again is that of driving and comparing student participation in the digital space to that of someone underage driving a car. So needless to say when this video by billgx came down the pipe (via Twitter I believe) I was all over it! It's simple, short and worth 1000's of words. I am going to add this to our growing list of videos on the topic of digital citizenship and let it do the talking! Another fine example of content creation and sharing at its best. What do you think about it? I work in a school district that realizes teaching digital citizenship is of the utmost importance and wants to do more to create a community of wise, educated digital citizens. So what we have decided to do is launch a campaign aimed at educating our faculty, students and our community in this area of digital citizenship. This effort is still in its infancy but we are planning on kicking off the community involvement component this fall by offering "town hall" style meetings where we will be bringing in various experts to share their thoughts on topics such as internet and cell phone safety, legal consequences of inappropriate digital behaviors, as well as cyberbullying and social networking. We have even gotten sponsors to offer door prizes (3 netbooks and an Xbox 360) as a way to encourage attendance. Our hope is that we can share ideas and information that will encourage parents and others in our community to take a serious look at their own digital behavior while empowering them with the resources they need to play an active role in teaching their children how to lay down positive digital footprints and become good digital citizens. We find that many parents want to be leaders for their children in the digital space but feel unprepared, so we are aiming to change that. We believe by giving them some practical tips and info, as well as sharing with them a common vocabulary that their children will be hearing on a frequent basis in their classrooms, parents will feel empowered to get involved in digital lives of their kids and hopefully make a positive impact on their future. We created a "teaser" video seen here that will be shown at all the school registration/open house events as well as school websites in hopes of raising an interest and encouraging parents to attend one of the meetings. What do you think? Have you tried implemented something similar in your district? If so, share a link or your thoughts in the comments. The Story of My "Second Life"